I’ve had the original version of the Wotancraft Ryker for years. It’s the bag I always keep packed and the one I grab when I get a chance to go somewhere interesting. To that end I’m both comfortable and familiar with the Ryker’s form and functionality. As an “everyday carry” I’ve always felt it was pretty much my ideal bag. Certainly, one thing I’ve never considered is the possibility of going smaller, that’s all changed. There was a time when I’d happily carry any amount of camera equipment and weight around without giving it so much as a second thought. More recently I’ve found myself unwilling and on occasion unable to carry a large heavy bag for long periods of time. My photography over the last few months has been “minimal” on the gear front, certainly by my standards. It has revolved almost exclusively around a pair of Leica’s and two lenses. A couple of recent additions from Wotancraft aimed specifically at Leica users have assisted me with this revised shooting setup. Firstly, I’ve made an almost seamless adjustment to the Ryker (S). I’m carrying all the same gear, my Leica MP (always), a second Leica, either my M7, M6 or M4 and two lenses. Plus, notepad, pencil, 1.4x Magnifier, iPhone and other random bits and pieces. I’ve saved myself some weight but, most noticeably it’s the slimmer profile on the hip that been most beneficial to me personally. Secondly, I’ve indirectly paired my use of the new Ryker (S) with a Wotancraft Python, their Leica Holster. You can see my full review of the Python on this site tomorrow. As usual, I’ve put the equipment through it’s paces and used the Wontancraft Ryker (S) extensively on my recent travels to Wellington. I struck me that anyone interested in the Ryker (S) is also going to be considering the Ryker (M). To that end I’ve utilised the schematics of the bags from the Wotancraft Website and created a Direct Size Comparison. Click Image to Enlarge. 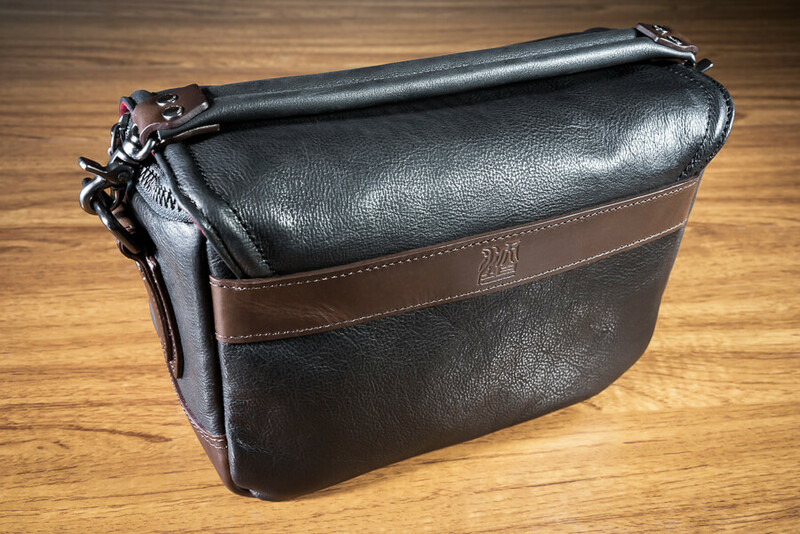 You know you’re on to a winner when the women in your house acknowledge it’s a very good looking bag……maybe they were lured in by the unmistakable smell of new leather. The New Wotancraft Ryker (S) is available in two colour styles - Classic Black Leather with Coffee Accents was my chosen style. It’s also available in Safari Green Leather with Coffee Accents. Both are beautiful and choosing was difficult, ultimately I felt the black was a more neutral finish. Wotancraft utilise two types of Leather on the exterior of the Ryker (S). Black - Skin Smooth Pebble Grain Cowhide and Brown - Two Tone Leather with a Subtle Sheen. These materials look great and are both hardy and durable. I make a point of highlighting that these materials will “mature” with age and use. My original Ryker no longer looks new but, it still looks absolutely great. The Ryker (S) is classic Wotancraft in every sense. Thoughtful design aesthetic, functional and meticulously crafted these guys really do make fabulous bags. 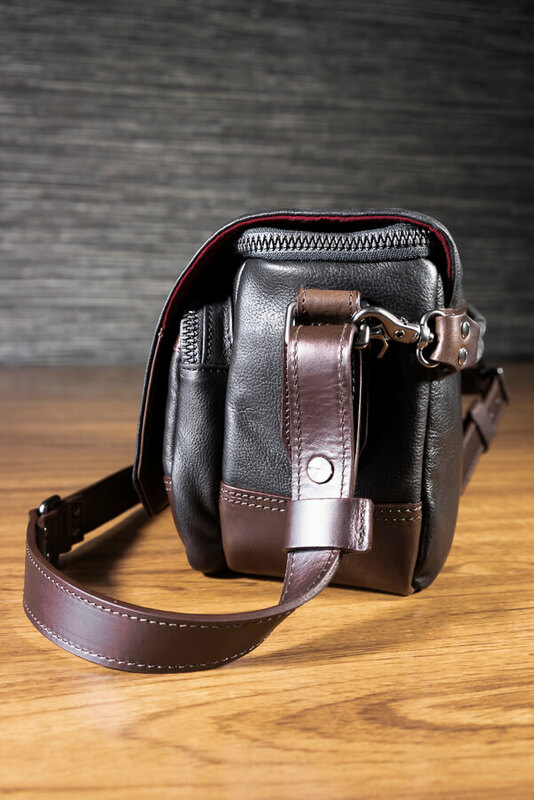 The padded shoulder strap has been upgraded since the original Ryker release. Wotancraft have incorporated their learnings from designing daypacks like the Wotancraft Commander (Reviewed Here) and applied that cushioned shoulder pad design to the Ryker (S). Couple this with the slight size reduction and weight saving and the end result is a much more comfortable carry experience. I believe the true test of a bag’s weight and comfort can be established by the amount of times you consciously and sometimes subconsciously move it from one shoulder to the other. For me, the left shoulder is my preferred carrying shoulder but I will switch when that dull ache begins to set in. I’ve found that I’ve been able to carry the Ryker S , my two film Leica’s and two lenses setup all day on the same shoulder without the need to rotate. My legs have tired before my shoulder and that can only be a good thing. Below: The outer flap is held with two magnetic retainers and lined with the Leica themed ”tone on tone” coloured velveteen. Below: It has to be said, the zippers on this bag are absolutely top notch. I’m really that excited about zippers? Yep…..they look great, appear very robust and their operation seems marginally more assured than the traditional Brass zippers used previously. Moreover the switch from previously used Brass zippers is another weight saving measure and every little helps. High quality zippers, buckles, studs and clasps are a standard feature on Wotancraft bags. At the risk of tempting fate I’m yet to see a component failure in the 6 plus years I’ve been using their products. In fact, the longevity of these bags is something I always try to draw peoples attention to. Outside of functionality it has to be one of their strongest features. A poster on my site recently referred to Wotancraft products as “Legacy Bags” and that is so, so true. Way back In 2012 I reviewed the Wotancraft Ranger, I used it extensively for a considerable amount of time. I then gifted it to a friend who has used it ever since, it still looks amazing. Only last weekend he mentioned to me that people still stop him and ask about the bag, I find that pretty amazing really. Below: Leather work is a craft I really admire, the handmade Wotancraft bags are made by true Artisans. The attention to detail, the precise stitching and hidden seams all contribute to making this a beautifully slick bag. Below: My Ryker (S) has shipped with a secondary handle. This can either be removed or adjusted from the rear to the top if one wishes to carry the bag by hand. At the time of writing I note that Wotancraft do not show this on their official page for the Wotancraft - Ryker (S) so I’m seeking some further clarification on it’s inclusion. The Ryker (S) interior is lined with the Velcro compatible microfiber lining, this allows the user to freely adjust the interior compartments to suit there specific requirements. I set mine up to hold the Leica MP with the Zeiss 50/1.4 and Leica M4 with Leica Summicron 35/2. Both with lenses attached to the bodies. This allowed just enough free space to fit in a JCH film holder, I often utilise a 120 film holder for 35mm as its a slimmer fit than the 35mm holders and a tiny bit lighter. By way of a small homage to Leica both the internal Microfibre and the Velvetine lining of the outer flap are “tone on tone” Red. A key feature of the bag’s zipping arrangement is the inclusion of the outward flipping zipper binder. When the zip is closed the binder closes neatly behind it to prevent contact between your valuable gear and the zip itself. A key feature of Wotancraft’s Medical Grade Microfibre Lining is it’s ability to resist tearing. By combining this with a “Short Hook” velcro, the fabric will retain its ability to lock to the dividers for many years and many position adjustments. The Wotancraft Ryker S ships with 3no internal dividers as standard. Position these to suit your personal requirements and you’re good to go. Take your customisation a step further with Wotancrafts Interior Modules. These can be purchased separately or, if you already have some with another Wotancraft bag, The Commander in my case, simply swap them out. 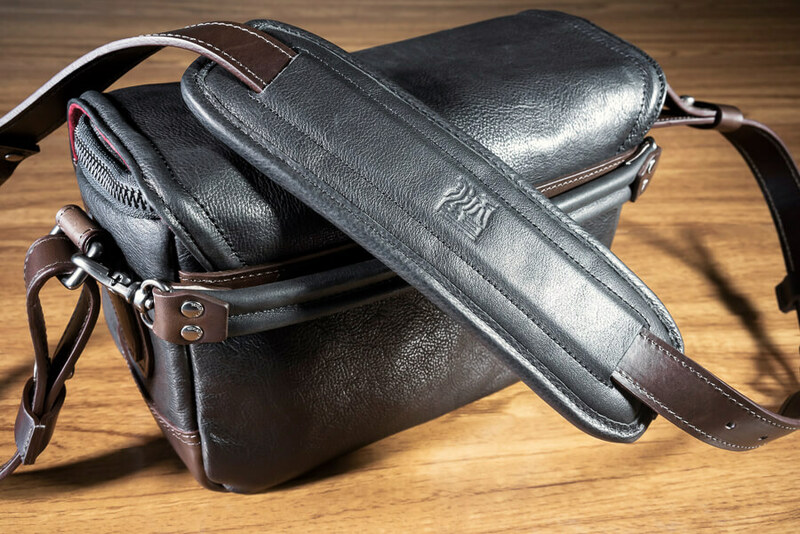 The Ryker (S) is the perfect two camera bag for those who like to keep things simple and light. Whilst it’s marketed to some degree at the discerning Leica user it is of course suitable for any number of Mirrorless systems and setups. Alternatively, it may just be perfect for your 35mm film cameras setup. In fact, whilst looking at various internal arrangements I established that it does work nicely for my Rolleiflex GX with a couple of film holders and a light meter. Great for when I inevitably feel the lure of MF calling….Whilst it may be smaller than the Ryker (M) it’s still has plenty of versatility. Over the years I’ve come to appreciate the importance of getting your bag selection right. In my experience it can have a direct bearing on your photography. Too heavy, uncomfortable, compromised functionality, all of these things have the potential to impact your ability to capture images in some way. It’s certainly worth going that extra mile to work out as meticulously as you can where your personal thresholds are in relation to characteristics such as weight. I have to admit, I have a new found appreciation of smaller bags and lighter setups. I’d already set off down that road before the Ryker (S) arrived but its something that has been reinforced since using this bag. When it comes to the Ryker (S) less is most definitely more. Form and function are the foundations of great design, add high quality materials and exceptional craftsmanship and it becomes a pretty intoxicating mix. Something I really admire about Wotancraft is the absolute refusal to rest on their laurels and the constant drive towards improvement. Clearly, they already have a winning bag in Ryker (M). But, they are able to push back against complacency and instead set about offering their customers two further adaptations of the Ryker. In doing so they enable the end user to get closer and closer to something that works perfectly for them. I applaud that. Thanks for reading, as usual I’m happy to answer queries and questions about the bag and potential setups.